So, 7:50am we headed out. Still not quite sure where we are always going or which door we'll be using, I followed slightly behind as we walked to St. Peter's - through the front door of the Basilica, down toward the Papal Altar, then left toward the sacristy. OK, I've been here before - I know how this works. We arrived at the sacristy and all the vestments were prepared for the Cardinals. His Eminence vested, and I threw on my surplis. At that point Msgr. Cihak happened past (the classmate and friend of Fr. LaVoie - who works here in Rome and is also one of the MC's here at the Vatican - I met him on Good Friday). We exchanged hello's and he asked if I could help him... "Put on your surplis, I'll take you to your seat, and you can assist with the distribution of Holy Communion." Certainly! No problem! Anything I can do to help. 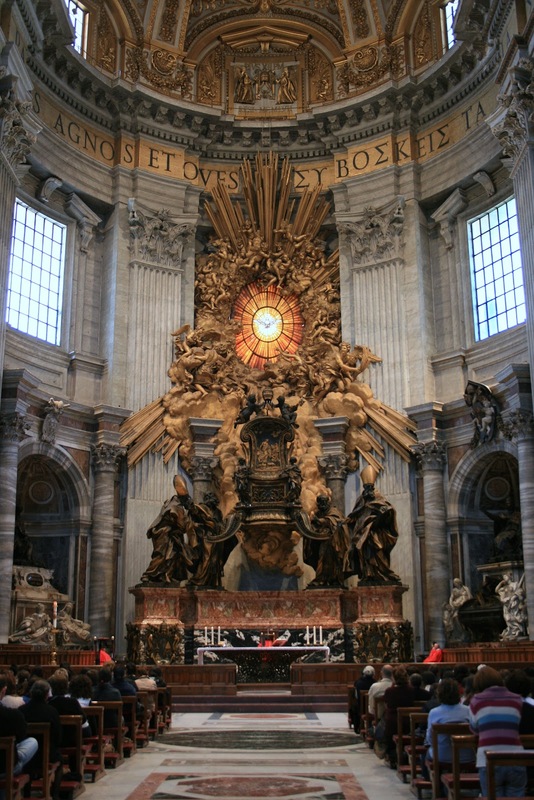 So we went out to the Altar of the Chair [I hope you've noticed the links within articles - trying to give you background and context to things I might mention but gloss over]. There Msgr. Cihak seated me in the front row so that, when it was time for Holy Communion, he could easily bring me (and three others) to the sanctuary to receive the Most Holy Eucharist for distribution to the faithful. Cardinal Sodano presided at the funeral. Beautifully executed liturgically (I would expect nothing less). When communion time came Msgr. came down, led us around the left side of the altar (where we received stoles) back behind the main altar and there we received the Holy Eucharist to distribute to the people. We were led to our places. As I was distributing communion the usher leaned over to me and said, "Father, if possible, only in the mouth." I had been distributing communion as I would at home in the States. Certainly. That is an easy switch. From there, only on the tongue. No problem. I'm sure that in a large church like that, with tourists everywhere, it is much safer (for the security of the Lord's Body and Blood) to give only on the tongue - so someone doesn't go home with some "souvenir" - not realizing what it really is. 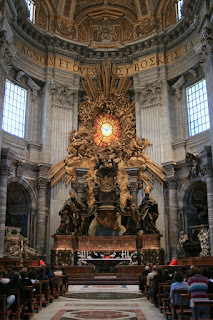 Suddenly, from my left, approached the Holy Father in a cope to preside at the concluding rites of the funeral. [I'm CERTAIN there is going to be a good picture of the Pope with me just behind him in the photo - when I find it I'll post it - or at least a link to it - but it will take at least a day or two for them to get the photos online... keep checking back.] I was only about 10 feet from Pope Francis as he processed past, dressed in a red cope with a very simple, wooden crozier. He led all the concluding rites (the prayer, incensing of the casket, and commendation). Then the procession of all the concelebrating priests, bishops and cardinals headed back to the sacristy - with the Holy Father, of course, concluding the procession. As the Holy Father was leading the concluding prayers, I know I was thinking, "the tourists in the Basilica, if they are Catholic, certainly hear Pope Francis' voice coming over the sound system - and must be squirming to catch a glimpse - but the security was, of course, VERY tight - and no one could get anywhere near to the Altar of the Chair unless you were there to attend the funeral. The casket was carried out, I returned to the sacristy to unvest and walked back home (I was detained in the nave because of the procession with the body, so Cardinal O'Brien had already headed back to the house). When I arrived, I said to His Eminence, "Well, that was a surprise." "Oh, the Pope? he said. "I didn't tell you about that, did I..." he said with a grin... Kept secret on purpose so I'd have this little "Saturday Surprise." Awesome surprise!! :) I look forward to reading your blog everyday!! How cool! You are having such an amazing experience!!! So happy for you!